Lydia Horan Caparosa is an Associate in the Litigation Department at MacDonald Illig. She is a member of both the firm's Commercial/General Litigation Practice Group and the Insurance/Personal Injury Practice Group. Ms. Caparosa is licensed to practice in all Pennsylvania state courts as well as the United States District Court for the Western District of Pennsylvania. 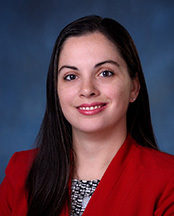 Ms. Caparosa graduated from Pennsylvania State University with degrees in Finance and International Politics in 2011. Thereafter, Ms. Caparosa earned her Juris Doctorate from the University of Pittsburgh School of Law. While at the University of Pittsburgh, Ms. Caparosa worked as a student law clerk for the Honorable Maureen P. Kelly, Chief Magistrate Judge for the Western District of Pennsylvania, and as a legal intern for Duquesne Light Company. Ms. Caparosa also served as a Pitt Law Ambassador, a member of the Pitt Law Women's Association, and as a volunteer tax preparer for the United Way of Southwestern Pennsylvania.